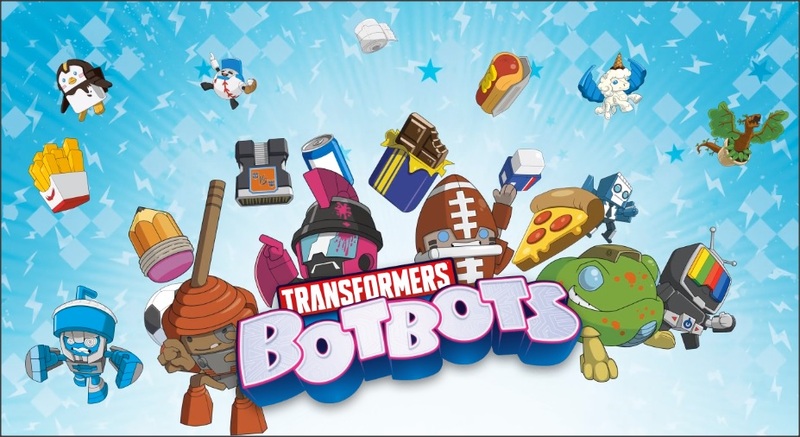 A commercial for Transformers: BotBots is now available on Vimeo. This video is as fun as the toys themselves. The commercial is uploaded by SkyCube; the production company behind the animation. Energon hit objects inside, they came to life as mischievous little TRANSFORMERS robots. These robots hide in plain sight at the mall, disguised as the stuff we use everyday. Transformers – BotBots from Skycube on Vimeo. Welp, looks like I’ve found another sub line to collect in between Siege Waves……doesn’t hurt that at most they’re released in Blind Pack thru 5 Packs, 8 Packs and eventually a 16 (?) Pack for the Arcade Renegade Set…..
ScreenRant has reveal new BotBots. I'd actually found names for most of those doing a UPC crawl a week or two ago, but this is definitely more pieces to help fill in the puzzle. That rubber ducky! beast Megatrons got a let! The playroom posse is practically everything I’ve wanted except for a tonal truck. I love the holiday ones too! So there are BotBot Shirts. There has to be a cartoon in the works or something. It's odd that several of these are adult sizes only. Ahh, there they are… now there's just 1 stinkin' lil' botbots evading me. Yeah, but now because of his comment I want a zamboni redeco/remold. Darnit. Hasbro, you son of a $#*@. I'm already giving you enough of my money! Now they need to make one with Hawt Diggity on it that says "I'm Your Wurst Nightmare". Figured out the 1 botbots I'm missing… the green zamboni thingy. Edit: and just like that, I answer my own question… under the escalator. I guess I should check off all the ones I have before hand before I ask questions, sorry folks. Duct Tape and Bubble Wrap. Bubble wrap, no… but I can see the duct tape. What could King Toots be reused as? I got a response saying that it was indeed a change in the new year due to federal policy. That’s unconstitutional, but that’s not EE’s fault. I just wish they had communicated the change to those with open preorders and let them know that. Ah, $&*#@. Well, thanks for the update. I wish there was somewhere else online that was selling the 8-packs as a case (that wasn't eBay). I dropped EE an email, so hopefully they can explain it. edit: I dropped EE an email, so hopefully they can explain it. Just looking at the second pic, it looks like they deducted the cost of your shipping from the total before evaluating it against their free shipping cutoff. – 12.95 for free shipping. = 67.04 as your "total." Then they charged you for shipping because your order total was now under the shipping limit. So yeah, they absolutely goofed. They needed to charge you for shipping before applying the deduction. Or they needed to simply *waive* shipping because your order total exceeded the required amount. As a software developer, I'm offended. That algorithm should never have gotten past QC.